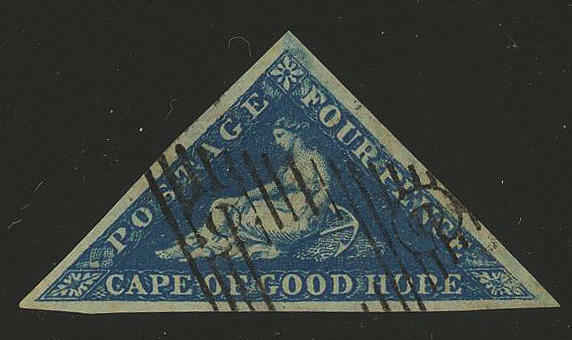 3568 ⊙ 2 4 P. Blue, bluish paper, fresh colors and on all sides with very wide margins with clear \"C stamp\". Outstanding quality! 3569 Bl.7/9Sp. 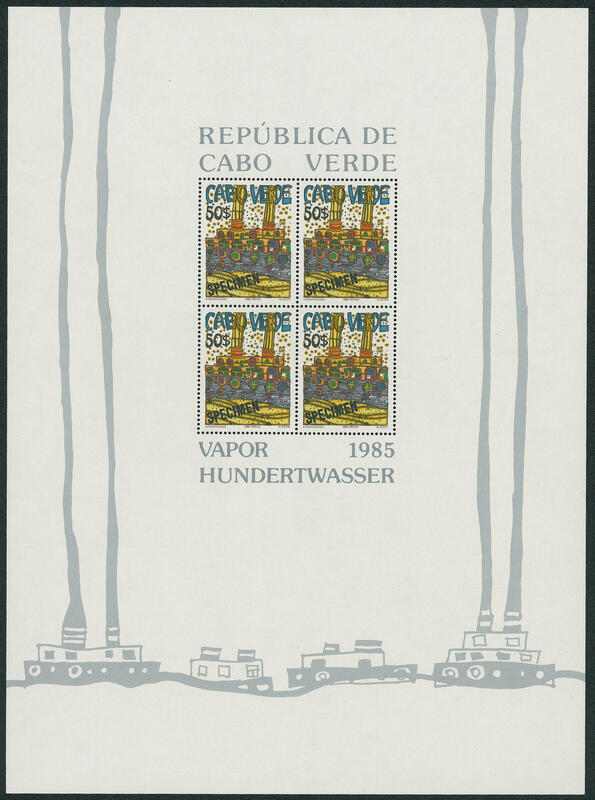 Hundertwasser 1985, all three souvenir sheets with overprint \"SPECIMEN\", in perfect condition mint never hinged an extraordinarily scarce set of samples, the only in few copies have become known is. Enclosed the presentation letter the Austrian country printing office. A rarity for the sophisticated Hundertwasser collection! 3532 ✉ 112 15 C. On 28 C., five pieces as pure multiple franking on cover with violet company cancel and number postmark \"10\" to London with transit and arrival postmarks. Decorative franking! 3548 51 10 R. Red / green, horizontal strip of four from right margin, wonderful fresh colors and very well perforated, in perfect condition mint never hinged in perfect condition. An attractive and scarce unit in selected quality! 3533 ∆ 9b 3 approximate. Orange yellow, fresh colors and in perfect condition with seal stamp in double postage with German post offices in China follower 5 Pfg. And 25 Pfg. 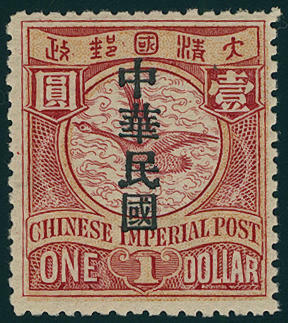 Crown / eagle with single circle postmark \"SHANGHAI 16.5.95. \", a very decorative and scarce combination! Expertized Bothe BPP. 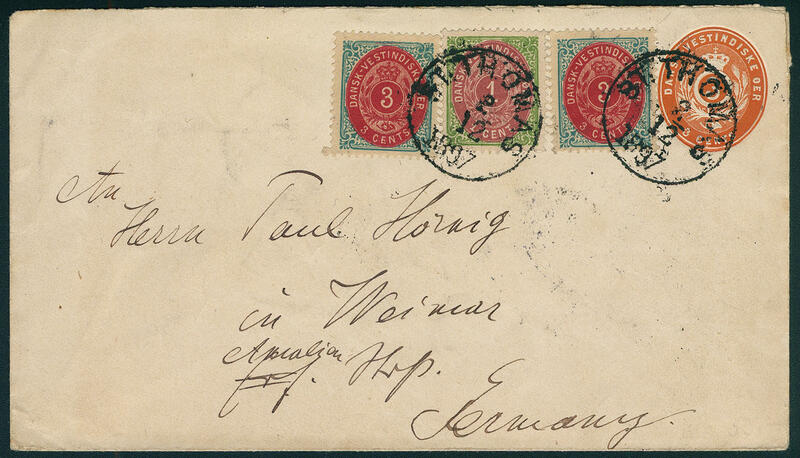 3534 ✉ 48/49 1 C. Ochre, 2 C. Red as additional franking on postal stationery postcard with scarce rectangle cancel in double postage with forerunner Kiautschou 5 Pfg. 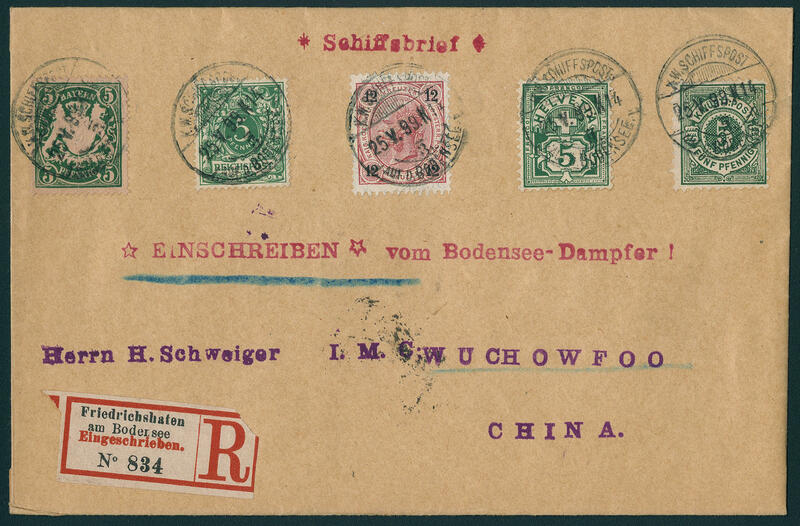 Steep overprint with single circle postmark \"TSINGTAU 9.10.00. \", a little patina, to Mehlis with arrival postmark. An attractive and rare document! 3535 121 1 Dollar dark red / salmon-colored with overprint from 1912, having bright colors, in perfect condition mint never hinged outstanding quality, without any signs. For the highest standards! 3536 ✉ Lake Constance sea mail, very nice registered shipÂ´s mail cover with five countries franking Bavaria, German Reich, Austria, Switzerland and Wuerttemberg with postmark \"K. D. ShipÂ´s mail on D. Lake Constance 25. V. 99. 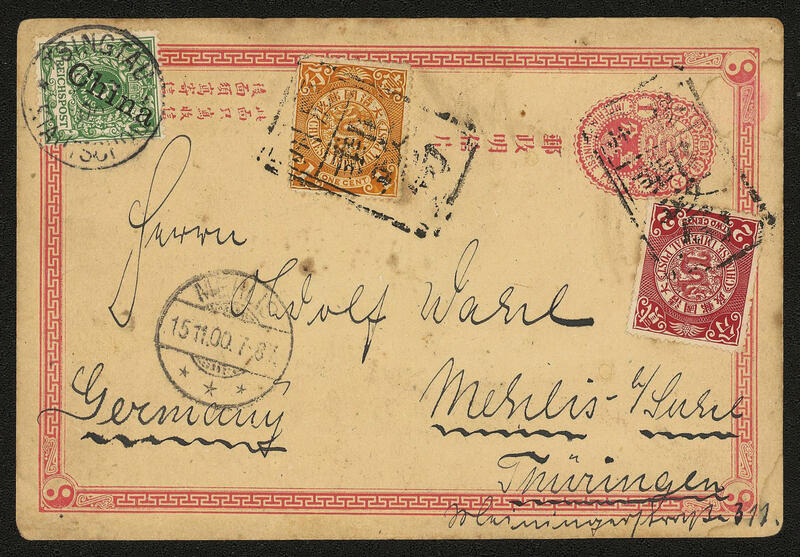 \" to Wuchow / China with on the back transit cancellation \"HONG KONG 23. JU. 99\" and entrance stamp \"WUCHOW 1. July 99\". Very decorative and rare! 3537 ✉ 42c German Reich, 20 Pfg. Dark ultramarine (Michel no. 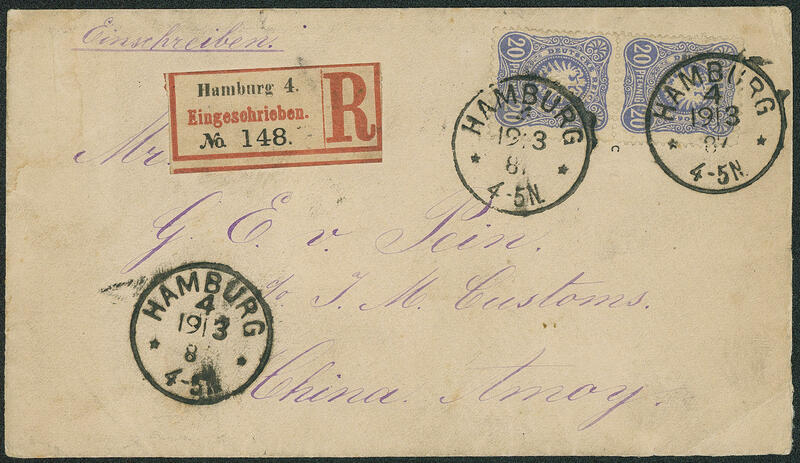 42 c), vertical pair on correctly franked registered cover from \"Hamburg 19.3.87. 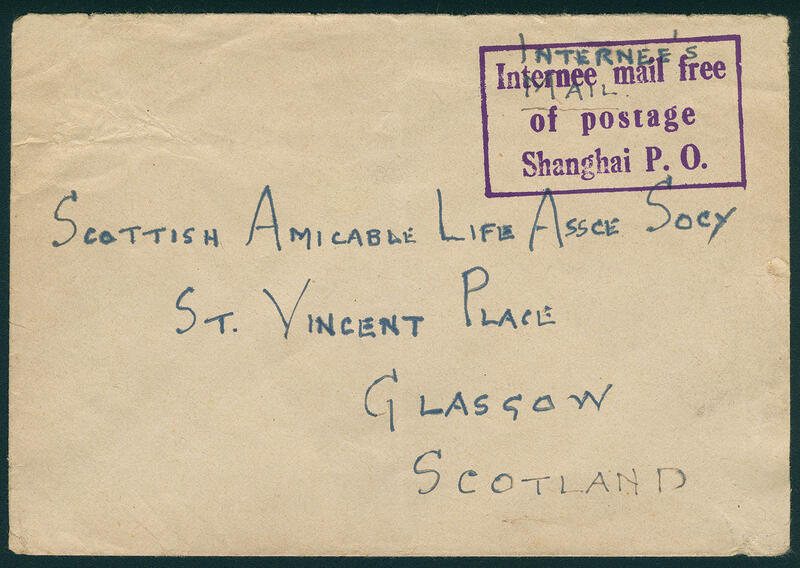 \" to Amoy / China with on the back transit and arrival postmark \"Hong Kong 21. AP. 87. \" and \"AMOY 23. AP. 87. \". A rare incoming cover, 15 years before official hours of the German postal service institute. In this kind are only a few documents have become known! Expertized Wiegand BPP. 3538 ✉ \"INTERNEE MAIL FREE OF POSTAGE SHANGHAI P. O. 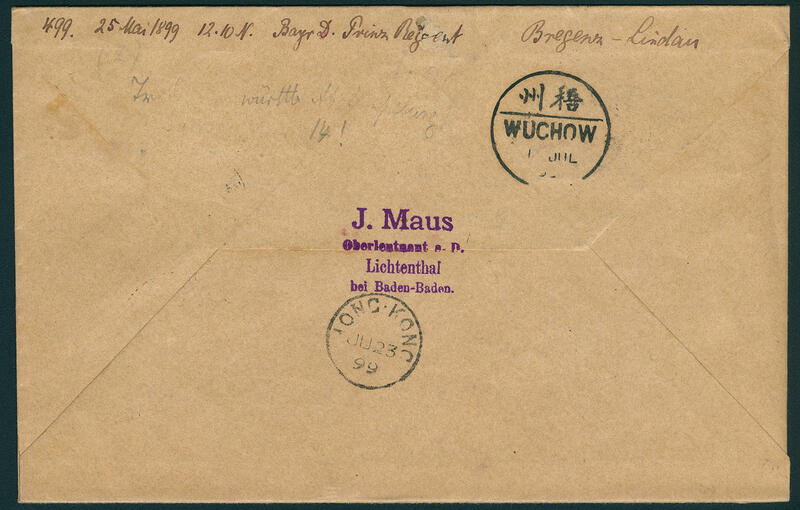 \", rare violet rectangle cancel razor-sharp on prisoner of war letter with on the back single circle postmark \"SHANGHAI 6.9.45\" to glasgow / Scotland. Very decorative and rare! 3539 ✉ Bavaria, 10 Pfg. Coat of arms on nice picture postcard \"souvenir DE BAYREUTH PARSIFAL\", a little patina, with single circle postmark \"BAYREUTH 24. July 99. 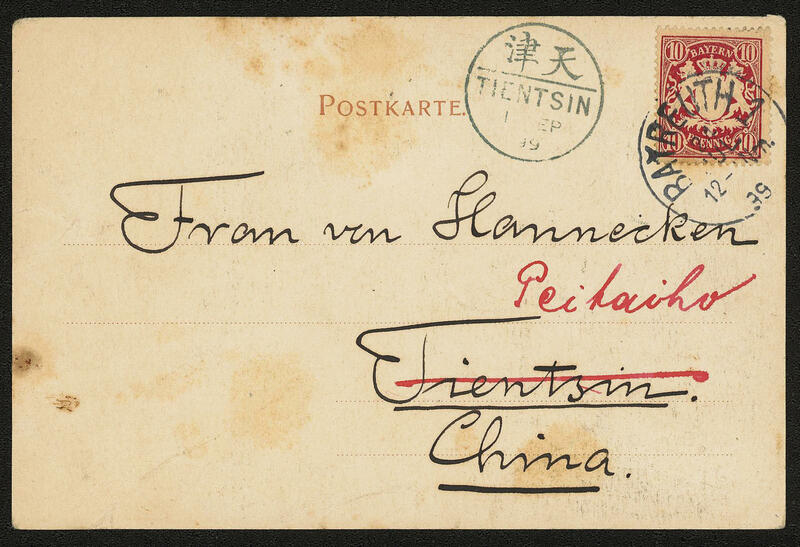 \" to Tientsin / China with arrival postmark \"TIENTSIN 1. September 1990. \" and forwarded to Peitaiho. An interesting document! 3571 5 10 C. Lighthouse 1920, airmail issue wonderful fresh colors and on all sides perfect margins, in perfect condition mint never hinged, as issued on ungummed paper. 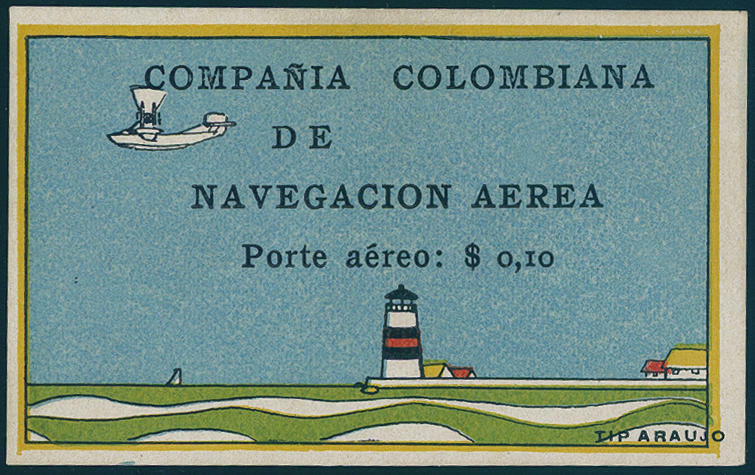 An outstanding quality this airmail rarity! Expertized tinker, photo expertize American Philatelic Society. 3572 ✉ \"SANTA MARTA\", senders mark on bar stamped cover, written at the 29. 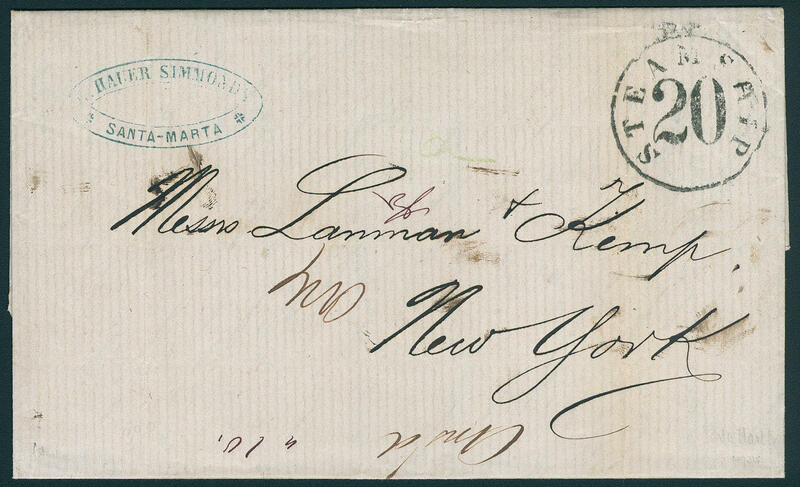 August 1867, with complete content, to New York with clear single circle postmark \"STEAMSHIP 20\". 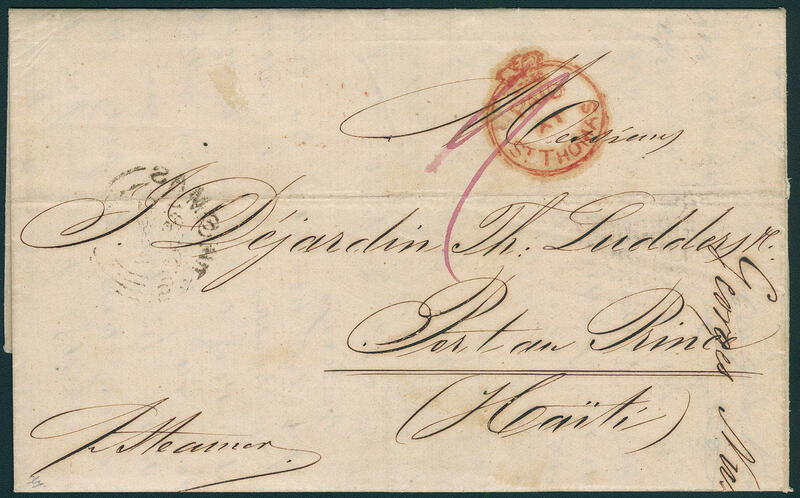 3570 ✉ \"FORWARDED BY RAMON LEON SANCHEZ CARTAGENA N. G. \", clear red oval cancel with additional red oval cancel \"FORWARDED BY C. J. 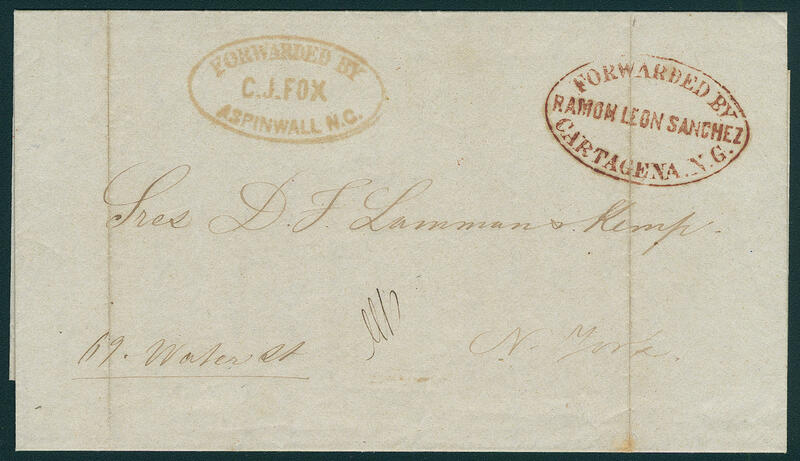 FOX ASPINWALL N. G. \" with full content, written in Cartangena 1859, to New York. Decorative and rare! 3573 248/55A/B Space travel 1975, all issues perforated and cut including the souvenir sheets, in perfect condition mint never hinged (Michel no. 248 / 55 A / B, souvenir sheet 2 / 10 A / B). Michel 405,- €. 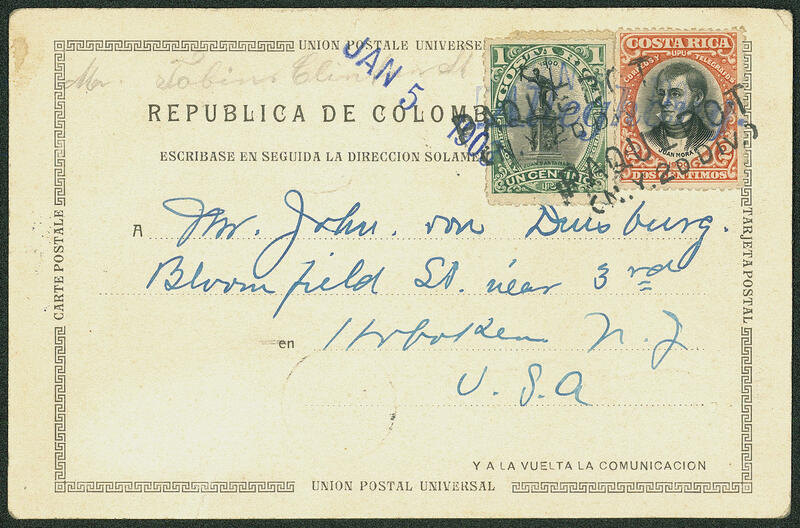 3540 ✉ 39/40 1 C. Black / green and 2 C. Black / orange on picture postcard from Cartagena with blue ship single line cancel \"ALEGHANY\" and date single line cancel \"JAN. 5.1903\" to the United States and there with two-line cancel \"Paquebot CN. Y. 2 D DIV. \" provided. 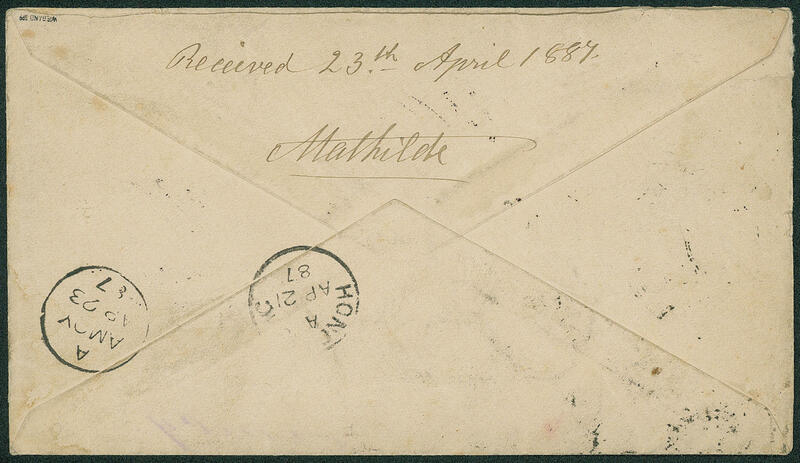 Reverse arrival postmark \"HOBOKEN 13. January 1903\", a particularly beautiful and scarce ship postcard! 3541 ✉ 65/67 4 C. Red in the horizontal pair, 5 C. Orange (2) and 10 C. Blue as additional franking on postal stationery cover 10 C. Pale blue with provisional registered stamp from \"SAN JOSE 5. ENE. 1918. 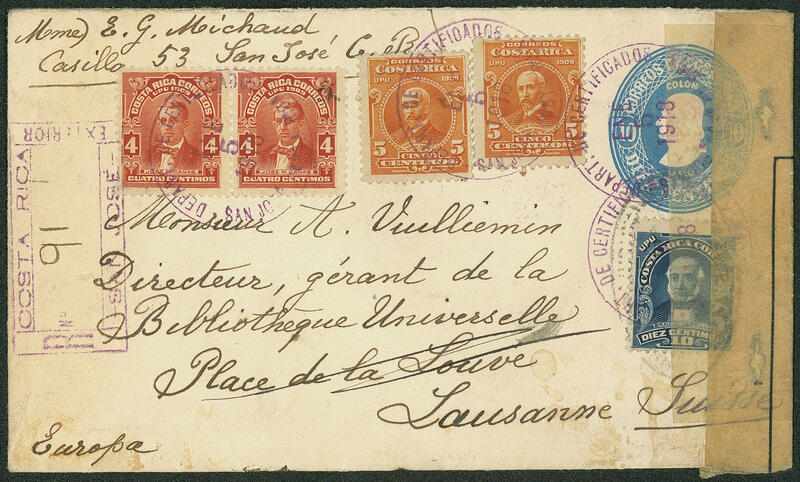 \" to Lausanne / Switzerland with transit and arrival postmarks, as well censorship strip. An especially attractive and very rare cover! 3542 ✉ \"PAID AT ST. THOMAS\", red crown stamp of the British post office clear on bar stamped cover with handwritten notation \"1 (SHILLING) \" to port au Prince / Haiti, with complete content, written at the 31. 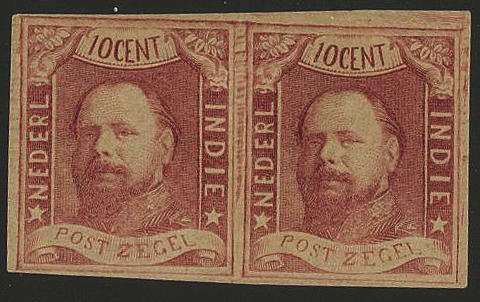 December 1862 with on the back stamp \"ST. THOMAS 31. DE. 1862\". Very rare! 3543 ✉ 5IIb,6IIb,U8 3 C. Orange, postal stationery cover with additional franking 1 C. Green / brown red, as well two examples 3 C. Blue-green / carmine rose, in each case with inverted framework, wonderful fresh colors with two clearly single circle postmark \"ST. THOMAS 2.12.1897\" to Weimar with arrival postmark. A particularly beautiful and scarce international franking. Outstanding quality! 3585 1 10 C. Lilac red 1864, horizontal pair, fresh colors and on all sides having full to wide margins in the horizontal pair, superb in every respect (choice copy). An attractive and scarce unit!